To join our mailing list and receive a monthly newsletter, click here. To join our collaborative “BaseCamp”, click here. Vector-borne diseases are responsible for over 17% of all the infectious diseases globally. Many of these diseases are preventable through protective measures, provided local authorities are aware of the potential outbreaks of the responsible vectors. Vectors are living organisms that are able to transmit diseases between humans or from animals to humans. These diseases include but are not limited to cholera, malaria, dengue fever, Zika, schistosomiasis, and West Nile fever. The vectors include mosquitoes, ticks, sandflies, fleas, and other insects. NASA data sets can be used to identify environmental conditions that may result in the onset of vector-borne diseases. These environmental conditions include surface temperature, air temperature, precipitation, soil moisture, vegetation, and evapotranspiration. At the present time, many researchers are using these data sets but most operational users have not begun to take advantage of the availability of these data sets. Other water related diseases including cholera can have widespread impacts on populations and are directly related to water presence, sanitation, and quality, environmental variables often disrupted during extreme events and natural disasters. For more information please join our Basecamp page. The 2018 Vector-borne and Water Based Diseases Workshop has come to a close. 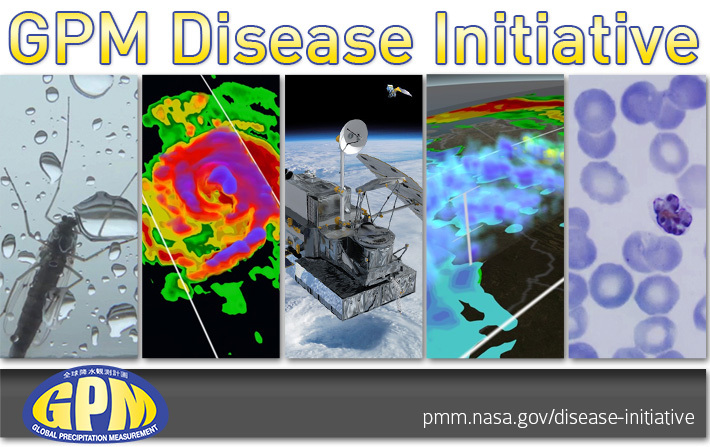 Please check back here for information about future activities with the GPM Disease Initiative and GPM Applications. The purpose of this workshop is to share some success stories to showcase how NASA data are being used to inform, predict, and better understand water-related and vector-borne disease. We hope to include researchers, government agencies, NGOs, educators, and a wide cross-section that includes potential end users to assist us in improving the applicability for these data. Participants will be aware of a wide range of resources they can use to conduct outreach activities to make the general public aware of the possibilities of using NASA EOS and PMM data to predict and respond to vector-borne and water-related diseases. We would love to showcase your research on vector-borne diseases! Please visit our Basecamp page or contact us to submit you work. This presentation can be used to share the potential diseases which are transmitted by mosquitoes globally. It also introduces the "GLOBE Observer Mosquito Habitat Mapper" app which is a citizen science tool for helping to identify and eliminate mosquito breeding habitats. It is appropriate for general audiences who do not have a background in epidemiology.